The BUILT FOR LIFE Fire Department program provides support, resources and materials for all U.S. and Canadian fire departments that make home fire sprinkler education a focus of their community outreach. Watch a short video about the BUILT FOR LIFE Fire Department program. Get up-to-date information about the fire service, fire safety and fire sprinklers. Read and follow Home Fire Sprinkler News. Find out more about the program and sign up to be a BUILT FOR LIFE Fire Department. 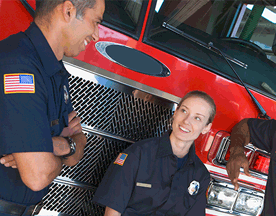 Find out which fire departments have already become BUILT FOR LIFE Fire Departments. A complete guide to building and using a dramatic live fire demonstration in your community.